Flexibound, 6.5 x 9.5 in. / 320 pgs / 200 color / 100 bw. Edited by Cor Wagenaar. Essays by Aaron Betsky, Ronald Brouwer, Helma Hellinga, Michelle Provoost, Paolo Scrivano and Ed Taverne. Foreword by Kristin Feireiss. 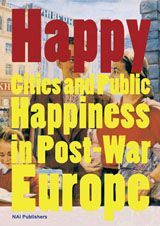 Happy: Cities and Public Happiness in Post-War Europe is the result of a fascinating search for expressions and representations of happiness in the European city during the second half of the twentieth century. Images of joy in which there is a relationship between three elements--happiness, the city and space--are collated and analyzed. Drawing extensively from Europe as a whole, from the Ukraine in the east to the Netherlands in the west, Rovanieimi in the north to Marbella in the south, this study by experts on more than 50 cities was coordinated by an international research team, and presents a picture that transcends the incidental and reveals fundamental motifs in the dynamics of our thinking about the city. 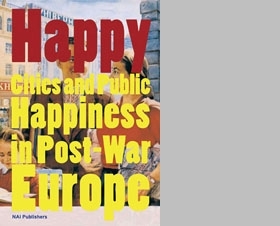 Happy presents an abundance of postcards, posters and photographs, and is a seminal exploration of the entire European territory using the theme of happiness. This stunning, unique overview of 50 years of post-War European history relating to one of the world's most universal themes leaves readers informed, pensive, entertained, and above all, happy. FORMAT: Flexibound, 6.5 x 9.5 in. / 320 pgs / 200 color / 100 b&w.